The whiter the diamond colour, the more rare and valuable it becomes. Most diamonds are graded by their lack of colour, with the exception of fancy colours such as pink diamonds. Diamonds range from colourless to light yellowish-brown. Diamonds are graded in special light conditions (i.e. a diamond grading lamp), and are compared to a set of master stones. Gem labs carefully sort diamonds to create a set of master stones ranging in saturation from colourless (D) to light yellowish-brown (Z). Using the GIA (Gemological Institute of America) diamond colour grading scale, a diamond is graded as follows: D representing the most pure white and colourless, and Z representing the most yellowish-brown colour. This diagram is an illustration of the grading scale, and is not necessarily indicative of true diamond colours. We recommend going no lower than near colourless, as the yellowish-brownish tint may become quite noticeable. The difference between each colour grade is very slight. Yet we find that the average person choosing a diamond for an engagement ring chooses between F and G colour. Choosing the colour is really about striking a balance of the 4 C’s. It is possible to still have a very nice diamond which is a I colour and larger than a smaller diamond which is a F colour for the same price. It comes down to a matter of preference. Below is an illustration of how the colour affects the cost of a diamond with the clarity, cut, and carat weight being equal. 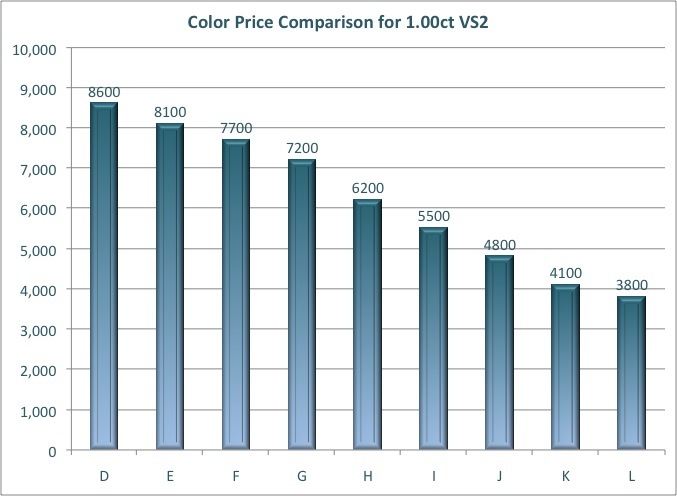 You can see that the different in value can vary up to 226% from a D colour to a L colour or between 5-17% between each colour grade. For this reason, one colour grade may be decreased one size in order to get the desired larger carat weight with the same clarity and cut grade.